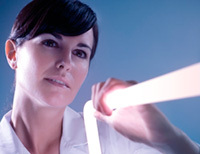 LATAB is a Swedish company, developing and producing LED illumination and controllers for machine vision applications. With more than 3000 standard products and a focus on custom-designed LED arrays the company offers one of the largest product ranges in machine vision lighting in the world. LATAB LED lighting is used for a great variety of vision and industrial applications. The LATAB product family is highly modular and can be used in various combinations to optimize light flow. The LED arrays feature superior light intensity and smooth lighting combined with long lifetime. The units are robust, small and easy to install. All modules, controller units and arrays are made for industrial applications. Due to a plug and play design, there is no need for adjustments. In addition to a huge range of standard products with short delivery times, we also make custom-designed LED arrays, lighting and control units with the same rapidity.